Too cute. Have a creative day. The pen nib is a nice touch to a perfect card. Thanks for joining us at Mema's Crafts this month, we hope to see you every month. your card is totally clever! What a beautiful card. So awesome and cute. Thanks for playing along at Scrap It Girls June Challenge. 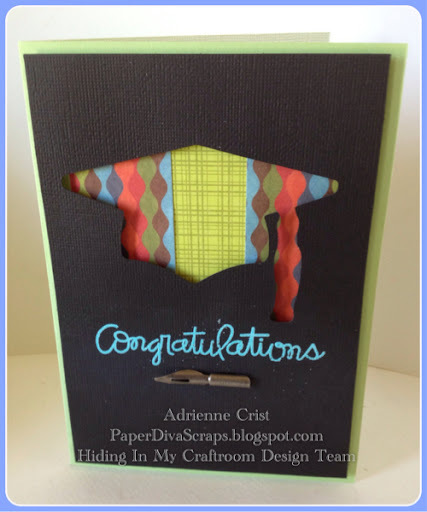 Hi, Your card is amazing and a beautiful card for a graduation, but unfortunately you entered my challenge at Lexi's Creations where the theme was 'Father's Day or a special Male Birthday Card'. Also you didn't list us on your list of challenges entered, I am sorry therefore you will not be entered into the final draw for a prize. Such a great idea using the pen nib. Thanks for playing along at Aud Sentiments. Such a great card, thanks for linking up at Aud! Wow, really cool! Thanks for entering at Scrap It Girl. Love the layered papers! Thanks for joining us at Scrap It Girl!